Selena Kaatz began curling at age eight, after spending many years hanging out at the curling club watching her parents play. Over time, curling became a more and more important piece of Selena’s life. 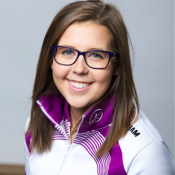 Now, Kaatz plays third for Manitoba curling rink Team Einarson, recently helping them made a breakthrough in the curling world this past year. 2016 has been a memorable year for Team Einarson and Selena in particular – the team won their first Provincial Scotties Tournament of Hearts in front of Selena’s supportive hometown crowd of Beausejour. From there, Team Einarson played in their first-ever National Scotties Tournament of Hearts, earning the attention and well-wishes of the entire province of Manitoba. They hope to continue improving, and eventually Selena hopes to make it to the Olympic Games.